Level 1 = witty remarks, badinage, lighthearted chit-chat. Level 2 is what most conversations aspire to—discussions of the house and car, the kids, reactions to the topics of the day, what new places have opened, what new films are out…. Level 3 is what many people fear; most conversations never, ever reach this level—not even among friends. Level 3 gets to people’s hopes and fears, their philosophies, their hatreds and passions, their secret beliefs. Like most people, the vast majority of my conversations linger at Level 2. But one of my New Year’s resolutions is to engage in more Level 3 conversations. A family vacation in San Diego with my husband and two kids in their 20’s is the perfect time for some real family bonding. Level 3 here we come! Vacation begins with one day in Los Angeles. It’s just enough time to dine, visit a museum, and engage in possible star sightings. Our first day is carefully planned to meet everyone’s diverse needs. First, we procure food for my strictly-Kosher daughter on Pico Boulevard, a haven for Kosher diners. * Next, we visit the Los Angeles County Museum of Art (LACMA) to see a Stanley Kubrick exhibit – mostly to entertain my husband and son. My top priority in LA? Dinner at Michael Voltaggio’s restaurant Ink. For the Top Chef uninformed, Michael Voltaggio is the winner of Season Six. This victory comes at the expense of Michael’s brother Bryan, his competitor in the final battle. And for anyone who is out of the loop on DC area dining, Bryan V. is chef/owner of Volt, Family Meal, and Lunchbox in Frederick, and the newly-opened Range in Chevy Chase. I have enjoyed Bryan’s cooking on numerous occasions, and he is among my favorite chef’s in the DC area. I am not going to pit brother against brother and decide who I think is the better chef. Bravo TV has already attempted that. But I can’t miss out on an opportunity to taste Michael’s food, which I know reflects innovative techniques and eye-popping presentations. Ink is in a swanky part of town on Melrose Avenue, down the street from the Kardashian’s shop “Dash” and many other high-end designer boutiques. If shopping areas were designated into Todd Kliman levels, this area would be Level 1. Lots of flash and not much substance. So I am somewhat surprised by the interior of the restaurant, which is stripped down and low-key. Wood, metal, concrete, and an open kitchen where I am straining to catch a glimpse of MV. I can’t help myself, so I ask our tattooed server (the entire staff takes the whole “ink” thing pretty seriously) whether Chef Voltaggio is expected in the restaurant tonight. He is evasive and I can’t tell if he doesn’t know or just isn’t saying. (I imagine he is thinking “it’s about the food people, not Top Chef“). But when we tell him we are from Maryland, and just days ago dined at Bryan’s newest restaurant Range, he is interested in hearing more. I want to try as many dishes on the small plates menu as possible, keeping in mind that I am with my vegetarian son and Kosher-keeping husband. (My daughter will only drink while we dine). Happily there are many enticing options that fit the criteria, so I don’t feel the need to sneak in my own dish. Burrata with bottarga (salted cured fish roe), little gems (lettuce), and lemon dressing start us off on our adventure. 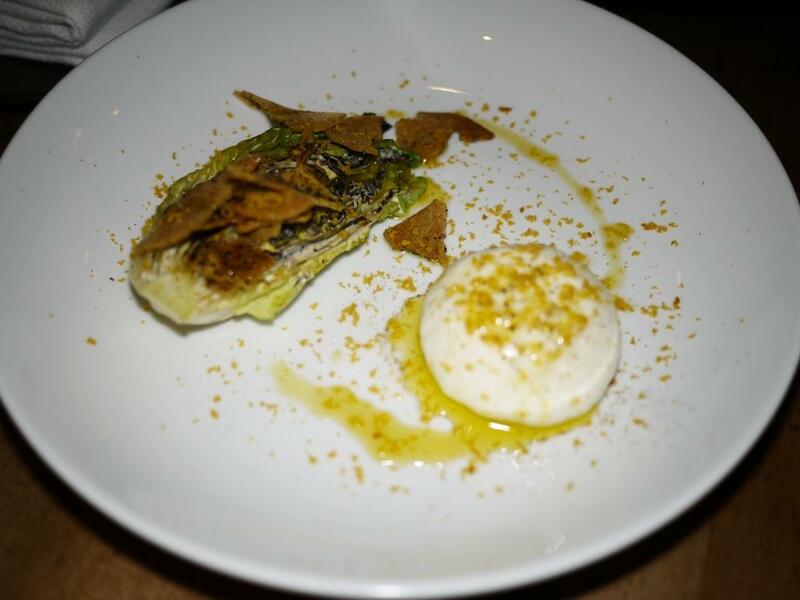 Like every dish that will follow, the burrata has contrasting textures and a layering of flavors. It is complex, it is smart, it is delicious. 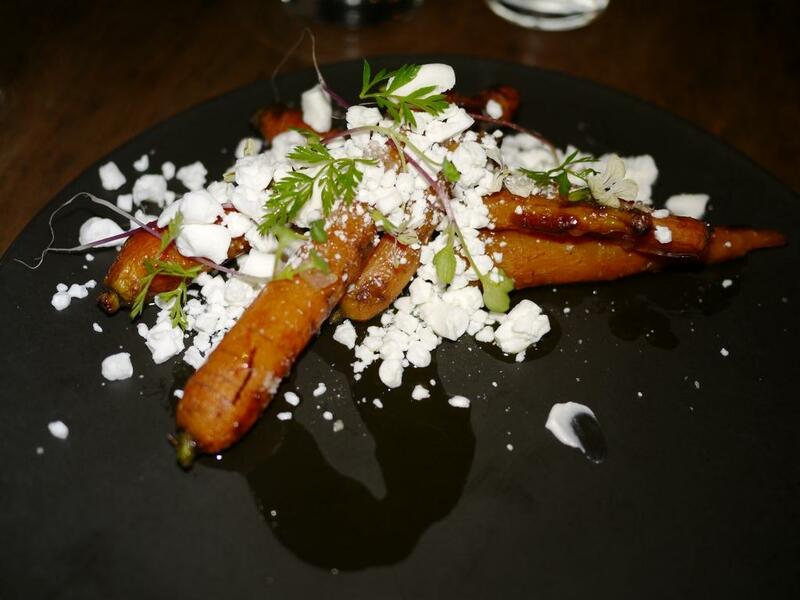 Carrots with goats milk ice, finger lime, and smoked oil is a contender for my favorite dish. 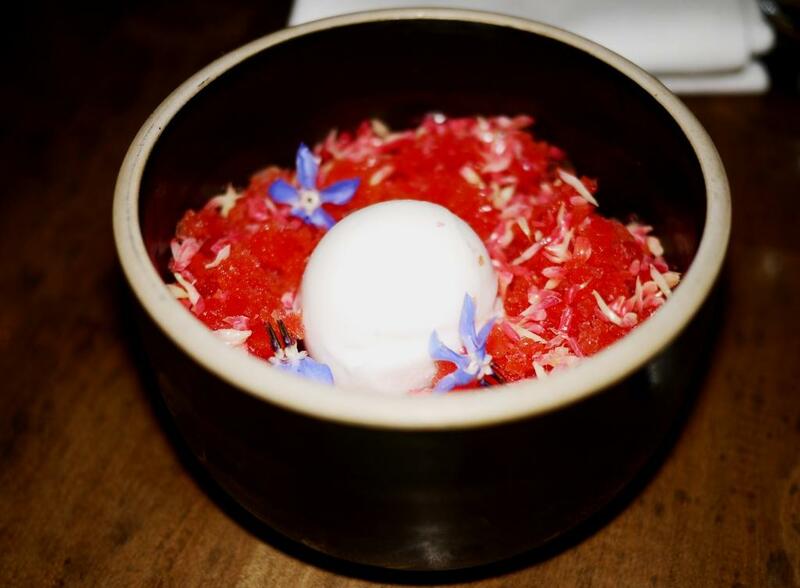 It is difficult to surpass the exquisite taste and feel of goats milk ice as it melts on your tongue. 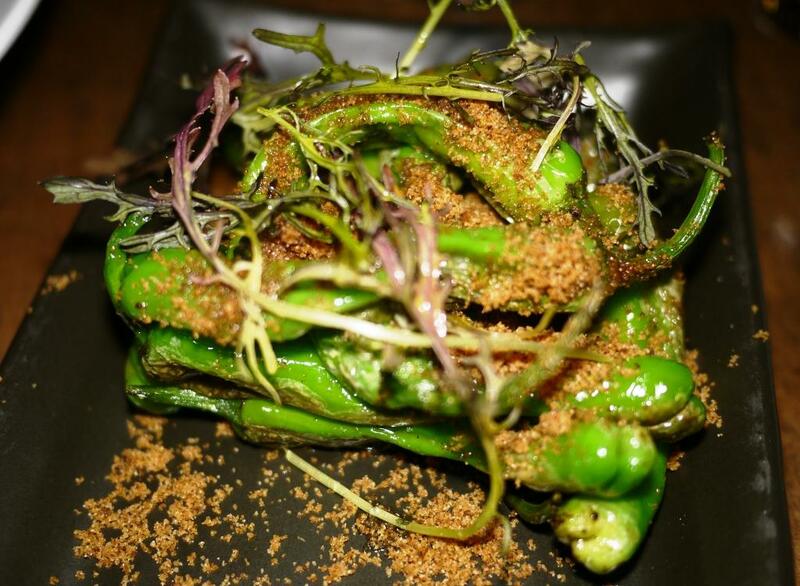 Shishito peppers with almond-bonito sand and tofu mustard aptly demonstrate MV’s creative genius in the kitchen. Someone at our table has decided it’s not the end of the world if a little fish gets in his vegetables. Just this once. 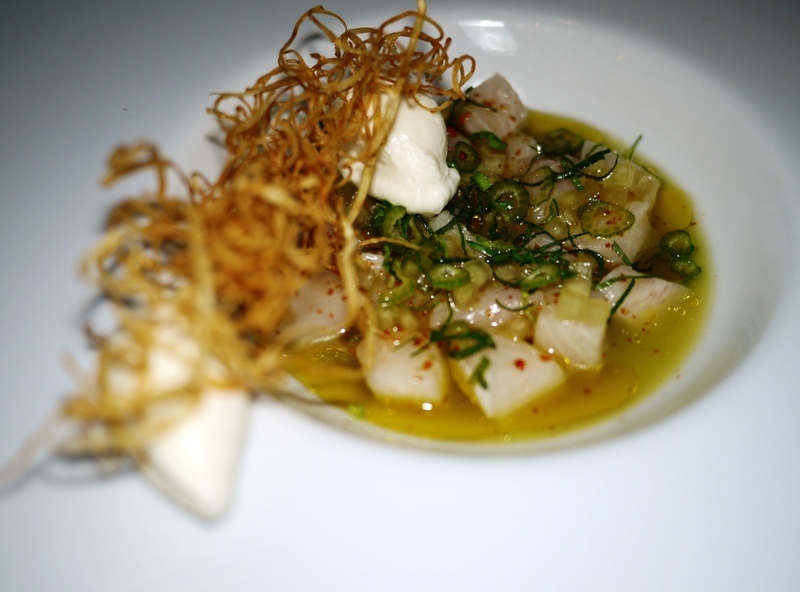 Ceviche with hamachi, green apple, celeriac bavaroise, and aleppo pepper has extraordinary depth of flavor. The broth alone elicits gasps of joy. 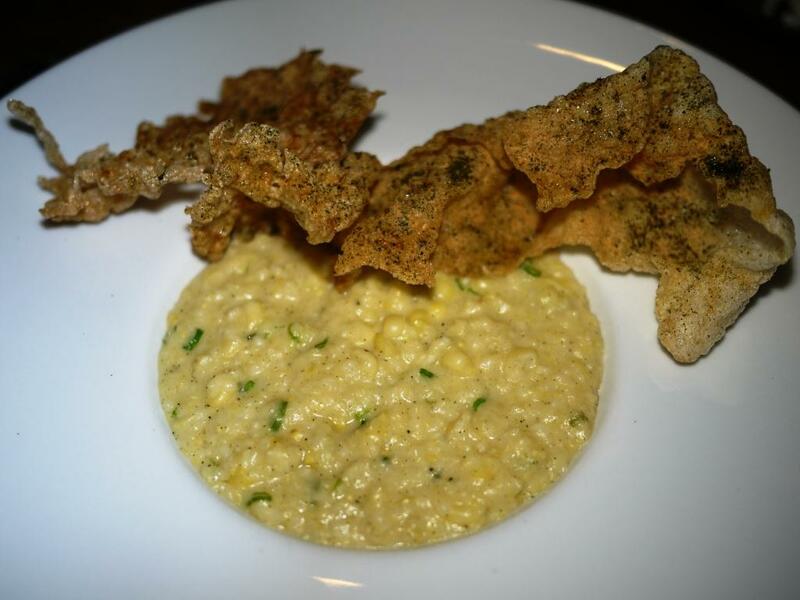 Corn porridge, with miso, housemade doritos, and nori is an eclectic combination of flavors that work perfectly together. 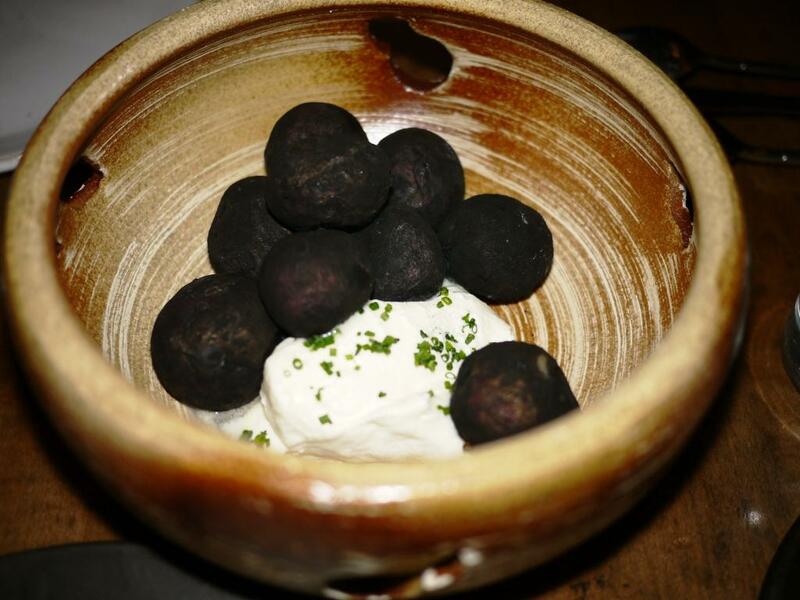 Potato charcoal with housemade sour cream and black vinegar requires audience participation as it comes with a spray bottle of vinegar. We are encouraged to spray sparingly at first while we decide how much of the ingredient is to our liking. I have fun spraying it over the smoky charred potatoes. How can a dish that looks like a pile of rocks taste so incredible? Branzino with roasted cauliflower, caper, and fermented grape is stunning. 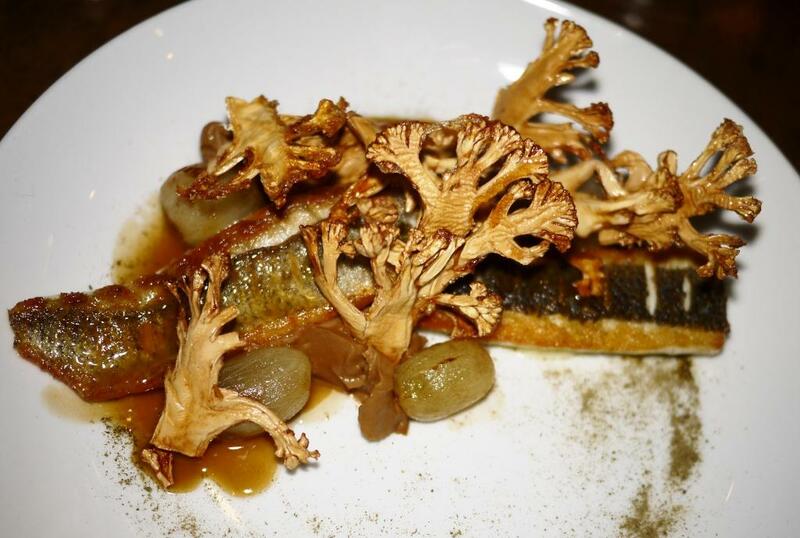 The fish is cooked to perfection and I adore the contrast between the pickled capers, sweet grapes, and crunchy cauliflower. This is the most amply portioned dish as well as the most expensive of our small plate selections at $30. Overall, I find the prices a fair value for what we are getting. We splurge on two desserts because we can’t make a decision, and vacations are for splurging. Greek yogurt with blood orange, Japanese peach, and coconut is cool and refreshing. I keep diving back into the bowl for the icy granules of blood orange. 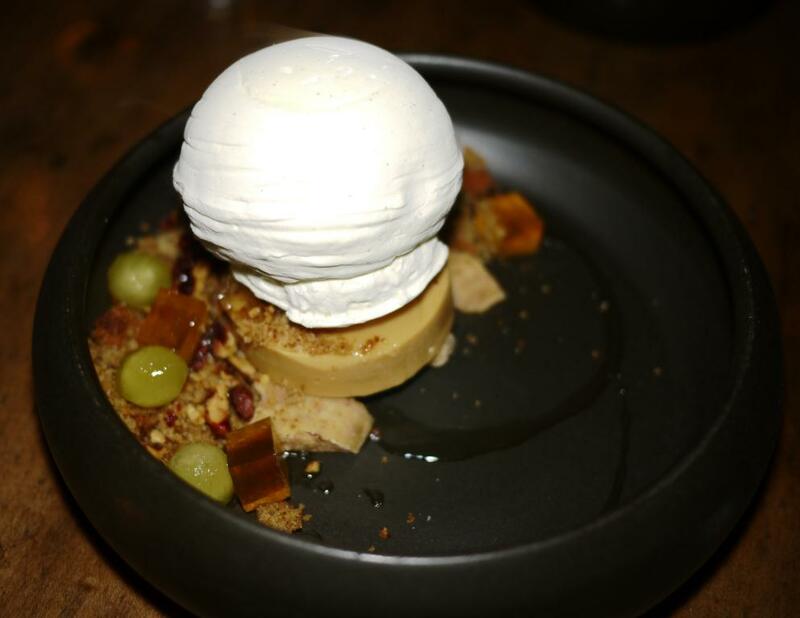 Apple, caramel, walnut, and burnt wood ice cream is both edgy and playful. We are handed a spoon and told to pound it against the solid white ball of ice cream. It explodes into shreds, a result of being cooked in liquid nitrogen. Burnt wood ice cream? We are skeptical before ordering, but we only need one bite to understand the appeal. Our meal at Ink is stellar, and on par with my favorite dining experiences of the year. The only negative is that the bar is set so high. It takes days of vacation dining before I eat anything else that I consider even vaguely memorable. As for a Level 3 conversation, we are far too tired. Our east coast bodies are three hours ahead of the clock. But it doesn’t really matter. We’re on an all too rare family vacation, and sometimes lasting memories are made just by being together. *If you are looking for great Kosher food in LA, look no further than these two establishments. They put out good food by any standards. I wish a Kosher restaurant in the DC area would follow their lead! The lamb and beef burrito is outrageously good, and the burrito is big enough for at least two meals. Visit their website for some highly entertaining videos.